Home » My VitaCup Review: The Next Evolution of Coffee, or Junk Science? My VitaCup Review: The Next Evolution of Coffee, or Junk Science? Every so often, a product comes along that makes so much sense and seems to be such a great idea, that it makes you wonder why it wasn’t thought of sooner. A fitness enthusiast, Brandon Fishman found himself increasingly dealing with feelings of fatigue and recurring illnesses. The problems soon became too large to ignore and began to derail his love of exercise. 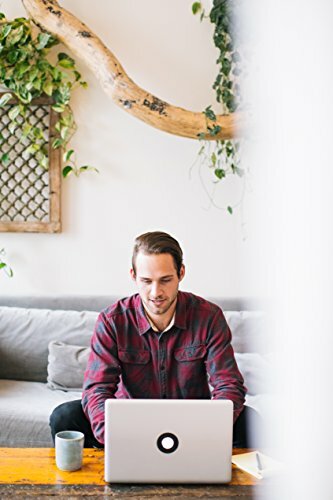 Deciding that things needed to change if he was ever going to get back to the lifestyle he so dearly enjoyed, Brandon sought out the advice of a nutritionist to help determine if his diet was the crux of his problem. What he uncovered was quite the shock, as Brandon found out that what was plaguing him was a vitamin deficiency, primarily of vitamins B1 and B12. In fact, B12, which is considered one of the key nutrients in the production of energy, is severely lacking in the diets of up to 40% of the U.S. population. Through a specially prescribed course of vitamin supplementation, Brian was able to abolish his health maladies and get back to his active ways, but while his health had improved, there were millions of others that were struggling with the same problems. 40% was too high, in his opinion, of a population that wasn’t living the lives they were so rightfully entitled to. We live in a fantastic era; one where the next great advancement in technology or medicine could be less than a sunrise away. But in our quest to build a better world, many of us have forgotten how to take care of our bodies. Our hectic lifestyles are of the “bag-and-box” variety; that is, in order to get through our day, we fuel ourselves with greasy drive-thru fare and load our shopping carts (if we even manage to make it to the grocery store to begin with), with sugar-laden processed foods. So it shouldn’t come as a surprise that so many of our diets are devoid of even the most basic nutrients we need to function properly. One thing, however, that many of us never forget to do, is start our day with a cup of coffee. A delicious cup full of hot java is a great way to tackle everything that a new day has in store for us, but as routine as the process of firing up the brewer before even brushing our teeth has become, man cannot survive on caffeine alone. It’s this daily intake routine that makes VitaCup particularly effective, in theory. Take your daily routine of drinking coffee and make it more healthy. Brandon Fishman knew this as well as any of us. Having experienced first hand the agony of being vitamin deficient, he realized there had to be a better way to help people get the vitamins and minerals they needed into their diets. Supplementing our whole food diets with vitamin pills is something that most of us have tried at some point, all in the name of good health. But what usually begins as an endeavor towards improving our lifestyle usually falls alongside a highway littered with other broken resolutions to eat better and exercise more. Vitamin pills can also be rather difficult for some to swallow, earning them the rather dubious nickname of “horse pills.” And even if you do manage to choke down a few every morning, do you really know if what you’re taking is doing your body any good? While there are a few reputable brands out on the market, the vitamin industry is a veritable landmine filled with sub-par products that simply go unused in the body, negating any intended nutritional benefit. Other formulas, such as vitamin liquids or candies can sometimes have an off-putting taste. And no matter how good something is for us, if we don’t like it, chances are pretty good we ain’t eating it. So Brandon knew that while many of us would slip into the habit of skipping their vitamin supplements, a good cup of coffee was something that was usually never more than arm’s length’s away. Thankfully, Jeff McIntosh knows coffee better than most. To Jeff, it’s more than just a jolt to start the day with; it’s a lifestyle, a family creed of sorts. He’s a fifth-generation roaster, and the family business has been very good to him. 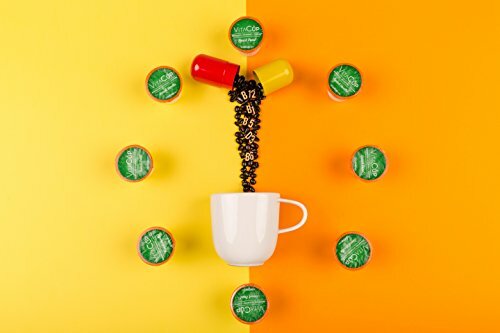 By working together, Jeff and Brandon spent an extensive amount of time researching, testing, and studying different coffee blends to come up with something that tasted great while delivering the key vitamins that would become VitaCup’s calling card. 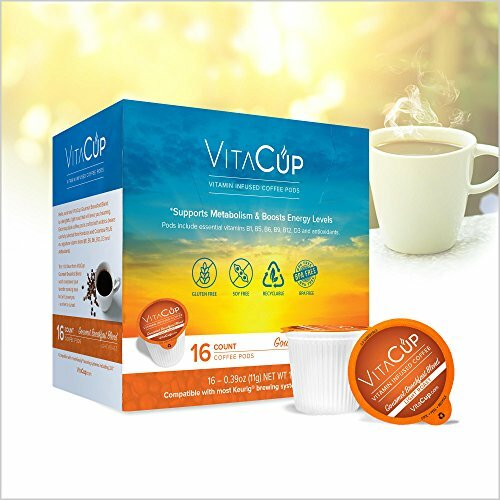 Formally launched in 2017, VitaCup is the world’s first, and only, vitamin-infused coffee and tea line created exclusively for single-serve brewers. VitaCup produces an assortment of coffee and tea products, in some of the most popular flavors amongst hot beverage lovers. Coffees incorporate a mix of beans from Columbia, Honduras, Mexico, and Brazil, which allow for a light taste profile with hints of chocolate and florals. 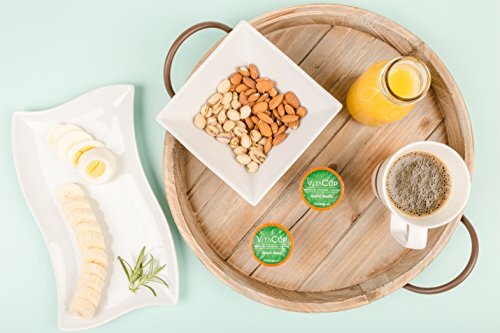 A single green tea offering includes matcha and moringa blends, each bringing their own additional antioxidant properties to an already high-quality blend of vitamins. All products are delivered in pods and are compatible with almost every single serve brewer on the market today, including all Keurig 2.0 machines (the company does provide a list of compatible brewers). But dumping vitamins into a coffee blend just wouldn’t work for Brandon and Jeff. The product had to taste great, be convenient to use, and manage to maintain the integrity of the vitamins themselves. And that’s something that VitaCup has achieved with every one of their brews. Regardless of the flavor or blend you choose, none have the gritty, dirt-like aftertaste that is often found in other vitamin-enriched products. A light roast brew that will perk up your senses and your taste buds alike. Expect a mild berry sweetness that finishes with notes of nuts. A medium roast of 100% pure Arabica beans. Brew up a cup and partake in the flavor of decadent chocolate and hearty nuts. Equally exquisite as an after-dinner drink as it is a treat for any time of the day. This is a drink for the dark roast devotees. Bold, yet smooth with creamy notes of sweet, aromatic vanilla. You can add creamer if you’d like, but you may not have to! A medium roast brew that delivers the same great coffee taste of all of VitaCup’s other coffees, but minus the caffeine. What’s great about this product is that while it may omit the caffeine for those susceptible to the jitters, the blend of vitamins still delivers a great pick-me-up for lasting energy levels. The latest addition to the VitaCup portfolio, this drink takes the concept of vitamin- enriched coffee to a whole other plateau with its inclusion of medium chain triglycerides (MCT’s), cinnamon, and turmeric. MCT oil is the most prolific of the additions to this brew, and for a very good reason. Multiple studies suggest that supplementation proves beneficial for the brain and heart, while also helping to improve endurance. Most often found in high concentrations in coconut oil, MCT has established itself as a beloved darling of the health food industry over the last several years. Not to be outdone, cinnamon helps to blunt cravings for sugar by balancing out blood glucose levels while also provides antioxidant benefits. And turmeric has shown to help prevent and reduce inflammation. If you’re having a hard time deciding, there’s also a number of bundles with names like “Best Self” or “Bold Genius” that offer different mixes, and are a great way to experience different brews until you find the one that’s best suits your tastes. 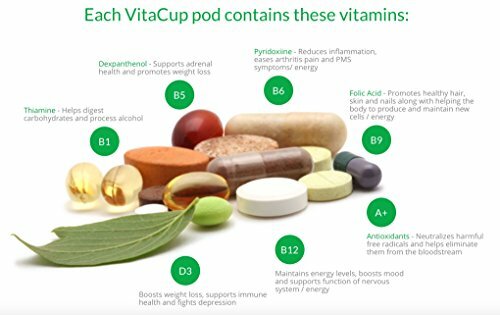 As we have said before, the VitaCup options include a blend of vitamins such as B1, B5, B6, B9, B12, D3, and antioxidants, helping to boost your energy level, increasing your metabolism, and enhancing your mood. Of course, the way you receive these vitamins can be absorbed in a lower percentage as if they were naturally in coffee, such as Vitamin C in oranges. It is important to say that the vitamins added are not synthetic and it is a good plus to have in something that you are going to drink anyway. Do any of the French vanilla or vanilla roast contain dairy? VitaCup Company never uses dairy in any on their products. So you can calmly drink your smooth and soft vanilla breakfast coffee if you are lactose intolerant. Are the VitaCup cups recyclable? Yes! The three parts in every cup are %100 recyclable. The aluminum Lid, the Plastic body -which is BPA Free and Food graded, and the Natural Paper Filter are %100 compostable. For those new to the brand, it’s hard not to recommend starting with the Genius Blend. The addition of MCT oil makes this brew a nutritional powerhouse. But if you’re a looking for a little variety or just want to sample all the best that VitaCup has to offer, then check out some of their bundles. The “Clever Genius” is a personal favorite. 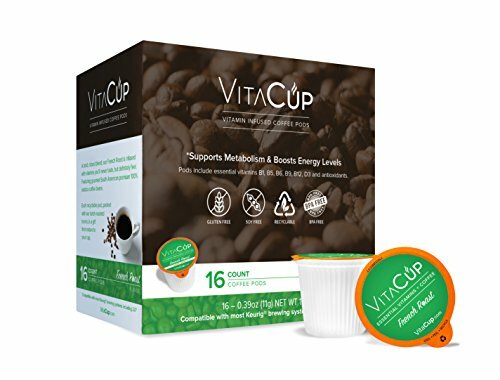 VitaCup is more expensive than typical other pod products, but the price is easily justified when you consider all of the added health benefits of drinking their coffee. To put it quite simply, you couldn’t purchase a high-quality vitamin supplement that parallels the blend used in a VitaCup pod and a box of your favorite brew for the same price that you could pick up a single box of VitaCup. The convenience factor alone is enough to warrant support of their brand, and while you may come for a great cup of coffee, the way you’ll feel after enjoying it will keep you around as a fan for a very long time. Previous Post: « Behmor 1600 Plus vs Gene Café: Which is Best for You?